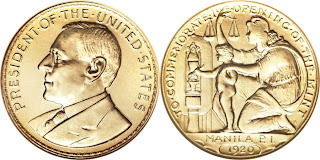 The year of 2008 saw some of the best auction results of Philippine numismatic materials, including the famous 1936 Woodrow Wilson Gold medal which commemorated the opening of the Manila Mint, the only mint built outside of the United States. 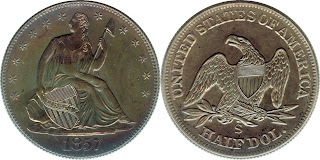 Even though only about 2 to 4 specimen are believed to have been minted, there were two auctions held both in the United States. The later auction was facilitated by Heritage Auction Galleries (HA), one of the leading international auctioneers of numismatic materials, antiquities, arts, memorabilia, collectibles, etc. 1920 Manila Mint Opening/Wilson Dollar in Gold, HK-1031, MS62 NGC. Gold, 38 mm. This incredibly rare so-called Wilson dollar in gold represents a once-in-a-lifetime opportunity for the many aficionados of this popular series. The long-awaited second edition of the standard Hibler-Kappen reference, released in 2008, contains a helpful note in the Appendix at the back, directing readers to the proper publication page for issues in the first edition "of which, at the time, less than five specimens were known. These issues were numbered from 1000 to 1033." Of course this Wilson dollar in gold, HK-1031, is among them. Dutifully turning to the proper page, one discovers that the second edition lists the Wilson dollar in gold as R-9, which it defines as "2-4 known." Our research leads us to believe that the survivors total perhaps three pieces in all. On July 16, 1920, the only overseas branch mint ever opened by the United States began operations in Manila, the Philippines. The Wilson dollar commemorates that event. As background (from Hibler-Kappen), the Philippines were ruled by Spain for more than 300 years, but were ceded to the United States in 1898, following the conclusion of the Spanish-American War. Some Filipinos began a resistance movement in 1899 that was crushed in 1901 with the capture of its leader. Then, making it at par with the 1920 Wilson medal is another legend in the realm of Philippine numismatic, the 1830 MANILA counterstamp, hailed as one of the famous and belongs to the top 5 rarest counterstamp coins. This extremely rare specimen which is also the finest was once owned by a curator of the British Royal Museum. This counterstamp was used for three years 1828-1830. In 1832, a charge was made to a smaller and simpler die for the MANILA die had proved damaging to the Mint’s coins and machinery (manifested by the poor conditions of Counterstamped MANILA 1828). Spain eventually recognized her former colonies independence, thus counterstamping was halted in the Philippines by edict on March 31, 1837. 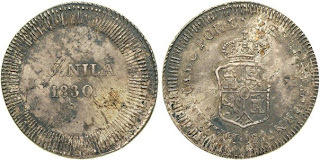 Of all the Filipino counterstamped coinage, the MANILA series are the rarest, with those dated 1830 being extremely rare, and currently, there is no other reported specimen at the hands of any private collectors in the Philippines. The crisis within the local clubs in the Philippines was one of the biggest shockers of 2008. The Philippine Numismatic & Antiquarian Society, the oldest numismatic organization in Asia was once again among the headlines in the international scene but on that year, it was a definite “no-no” far away from the legacy left by the founding fathers. The scandal was a result of the fight among the members and officers of the organization which, later ended into a court suit. It was sad to find that the organization’s directors are fighting among each other not for the benefit of its members and for the organization’s vision but for a contract from the Bangko Sentral Ng Pilipinas (BSP) regarding the proper grading and cataloguing of its Money Museum which according to one insider amounts to several million pesos. Other issues were the sudden disappearance of the organization’s secretary, Marlon Roxas who was being blamed by some directors responsible for the loss of some collection, funds, and other important documents of the organization. Hopefully, the year of 2009 will bring some positive changes in the organization and that the new set of officers will be liable and more responsible to their members and to the organization itself. The year 2008 otherwise saw the proliferation of several counterfeit coins and banknotes. Several collectors were surprise by the sudden appearance of high-value McKinley gold certificate which were reported recovered in the island of Palawan as part of the fabled lost vault that was lifted by a military aircraft that crashed in a still unknown location in the same island (Palawan) on its way to Manila. Of course, who will forget the number of collectors who bought the fake liberty halves, which mysteriously surfaced, in the busy streets Quiapo. The coin was so comparable to the genuine article, that the weight of these coins was amazingly equal to that of the genuine (12.5 g), a characteristic not anticipated by the modern collectors since Chinese counterfeiters (the suspected culprits) were known for producing underweight fake coins. Other bad news for collectors was the sudden rise of fake counterstamp coins; a fake counterstamp placed on a genuine host coin. These coins were mostly being sold by Ebay sellers and coins dealers who have managed to duplicate the original counterstamps. Now, collectors especially the neophytes and the novices are encourage to do their homework before bidding to avoid purchasing these counterfeit materials. As the global economic crisis unfolds, 2009 will be a very exciting year for collectors since it has been known that crisis always bring hardships and opportunities. Goodluck and happy hunting!